Stayed here for two nights and found the Park one of the nicest and cleanest Parks we have been in in a very long time. All sites were gravel and well maintained. Hooks up were very good other than the sewer hook up is above ground level so you should use a sewer hose support. Very clean park with no unkempt long term units which makes a great change. Everyone seems to take pride in the place including the Mobile home park which shared the Pool (closed due to season) and community room. Nice dog park as well. Gal at check in whom had served our country was gracious and accommodating. We will stop in again next trip through. Good length of spaces. Easy access. Good sized dog park with grass.. gravel parking with concrete roads. 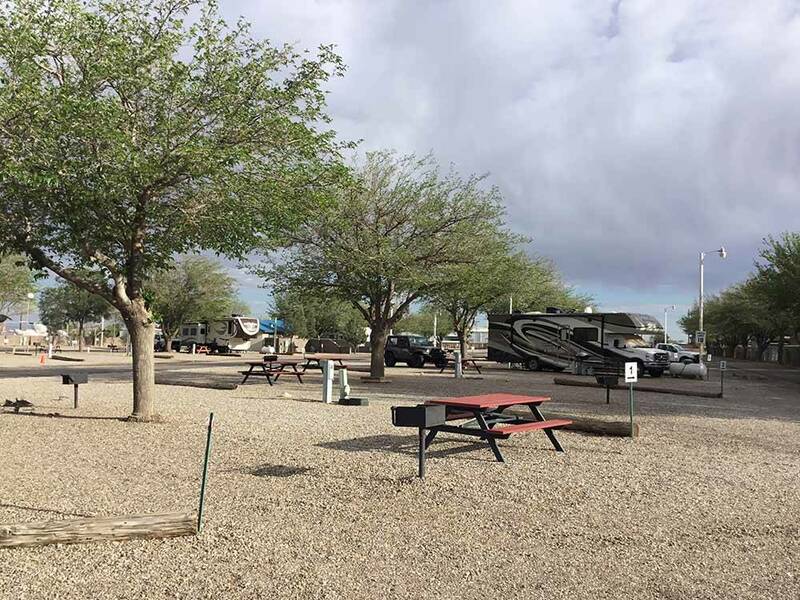 This is our "go to" campground when visiting the Roswell area. We are always placed in the newer area with concrete roads and spacious graveled areas. Stayed in September in 35' class A with toad. Stayed in the newer section behind the main park. Sites were gravel and fairly level. Hook-ups were OK, but septic is raised so drainage is poor. Staff was very friendly. Quite a few long terms, but park was fairly tidy and quiet. Did not use facilities. Not the park's fault, but the air was pungent with that special smell that livestock has. And probably as expected about a billion tiny flies to drive you crazy. You will not be spending time outside. Dog area was nice but located a long ways away near the mobile home park. Excellent front desk assist! Great space, easy to get in and out of. Plenty of room between rigs. Wonderful, quiet location. Highly recommend and will stay here again next time I pass this way! We stayed one night here. We arrived after hours and they had everything ready for us. Very nice, clean, neat, well organized campsite. We stayed in the newer section which had a nicely paved road, new restrooms, lights, and level pads. The maintenance person was making rounds when we were hooking up. Restrooms were spotless! We stayed in the newest section. They have planted trees which need a little time to mature to offer any shade. Friendly management at the office. Good experience. This was our second experience at this site. They have expanded and expansion has concrete roads, graveled sites, newly planted trees, a bath house and ample trash containers. The new site was a very pleasant surprise! It is located at the corner of two four lane roadways, but traffic is not disruptive. Roswell itself is an interesting experience ... a lot of history (alien museum). Bitter Lake Wildlife Refuge is nearby and a must see. Many, many authentic Mexican Cafes/Restaurants ... another must do! We would stay again. There is cable. I think, as RV'ers, we need to compare apples and apples. Is this a beautiful scenic park in the middle of a beautiful area? No. It's in Roswell NM. It's desolate and well... kinda ugly truth be told. If Aliens landed here, I"m sure they turned around and went home. I would have if it weren't dead center in the middle of where I was coming from and going to, and I couldn't go any further. That said, this isn't a bad little place. I would have given it 3 stars, but for that they aren't calling themselves a "Resort." This is an RV park. And for that; they exceed expectations. Sites are long and relatively flat. If you have a big'un you may need to straddle the "hump" in the middle. It is all gravel and concrete, HOWEVER; the dog park and area around has lovely paw-friendly grass. The dog park has a new little baby tree that will be nice in a few years. There are a LOT of long term residents here, I think that's the main focus of the park. But, it is tidy and not skenky looking, and everything is new (like other reviewers say) and well kept. EXCEPT: and here's where they lost the star for me... The pool was empty. If someone had told me at check in, I may have left them the star. There are some older trees in the older part, and lots of promising baby trees in the new part. I give them snaps for looking ahead and setting something up for the future. In all, I would return here, but only to stay over. Not a destination in and of itself. OH, and the price went up from Good Sam; out the door was $40; which is high for a concrete lot with an empty pool. Nice dog park, though. Spaces are to narrow for Class A with four slide outs. No picnic tables. No room to set up your own chairs and barbeque grill. We stayed at this park for one night. The sites were gravel but level and each site had a bit of shade for which we were grateful. They were very pleasant to work with and we encountered two minor issues that they resolved immediately. We didn't use restrooms, showers, laundry or anything else other than our full service hook-ups. We would stay again. Very clean and well kept location. We were visiting for the UFO festival in Roswell which was about a 15min drive into town. The spots are spacious with all rock and NO grass. If you have a dog that is picky and needs to pee on grass you might want to ask for a spot closer to the dog park. The dog park was a large run, no shade for humans but perfect run for the dogs to play. The staff here are top notch!! They were friendly at check in, during the stay and check out. They even hosted a 4th of July BBQ and fireworks and made sure we were aware and could attend. We stayed here for 2 nights in the new section at the back. Very easy to find and get into. Large new sites, utilities all new. Very close to the downtown area. Bathrooms and laundry were very clean. Would stay here again. We stayed in the "new" section which is at the back of the park. That part has nice wide concrete driveways and gravel sites. Not exactly level even as it seems they could have been made level. They seem to have a hump in the middle. Wi-Fi was almost unusable, super slow even at 6:30am. Restrooms were nice and the entire new section is clean. They have an extensive selection of DVDs which they lend out. We paid $38 per night after GSC discount plus tax. Very efficient check-in. Gravel mostly level pull through site with easy access. Did not get the chance to use the pool. Office and grounds are clean and well maintained. Did not use restrooms. Would stay here again if in the area.